I am developing a model to simulate the cost of coverage increases by 20% per year for 7 groups. 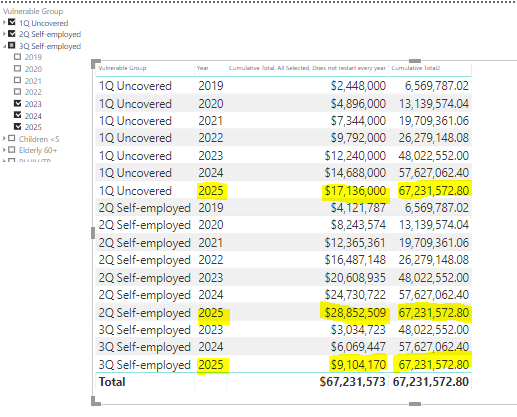 I am using a hierarchy slicer to enable the end users to select the group and start year (2019-2025) for the scale-up assuming a 20% coverage increase every year maxing out at year 5. I want to create a measure to calculate a cumulative cost total. Measure 2 is calculating the amount for the year even when it is not selected, but when any other year for the group is. Any ideas on how I can adjust this measure to account for the year sub-selection? I have a couple ideas but instead of going back and forth, can you supply some sample data? Please find attached the link to my working file. 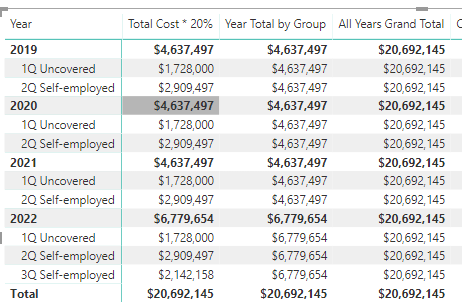 As you can see on the first tab- “Cost Modeling V2”, I am able to control the costs by group and year, however the stacked column cumulative totals do not adjust accordingly for each year. I was also wondering if you may know how to get my slicer to auto-select every year after the first year? Any guidance or advice you may have is most welcomed! Nothing happens when I click the hyperlink to download. can you re-add? Here it is. Thanks in advance for your kind assistance. Added a “Total Cost” column in the FactMaster table, instead of having DAX do it. Much easier to follow I think. 3/4. Cumulative totals of what is selected that does and does not reset every year. I wasn’t 100% sure what exactly you were looking for, but I think it’s a good starting point. Thanks for all your work on this. I am still working through the model restructure to make sure I understand it. It certainly looks much easier to manage. The problem seems to start in Year 2022. You can see it most clearly in the last stacked column for Year 2025: there are 3 sub-groups for $10M + $29M + $161M. When I use my hand calculator that totals to $200M. However, Power BI is calculating $207M. What do you think? I believe the problem is that when I select any Year within a group Power BI is adding the totals for all previous years for that group to the cumulative total instead of just adding the totals for the selected years. For example, in 2025 the individual group amounts are $17M + $29M + $9M = $55M however 2025 overall total is $67M. When I add the 3Q Self-employed values for all prior years that are not selected, it accounts for the difference. Thanks in advance for any guidance you can provide on how to limit the cumulative total to the selected years. I will take a closer look at this in the next couple of days. It’s a context / filter issue for sure, just have to mess around with it to see what shakes out. Thanks much Nick. I am also interested to know how I can copy that date table you produced into a new data model. Could you also steer me in the right direction? 2022 is where the filters become asymmetric, but keep filters accounts for that. Now the issue I am running into is to use that “Year Total by Group” and building a cumulative sum off of that. 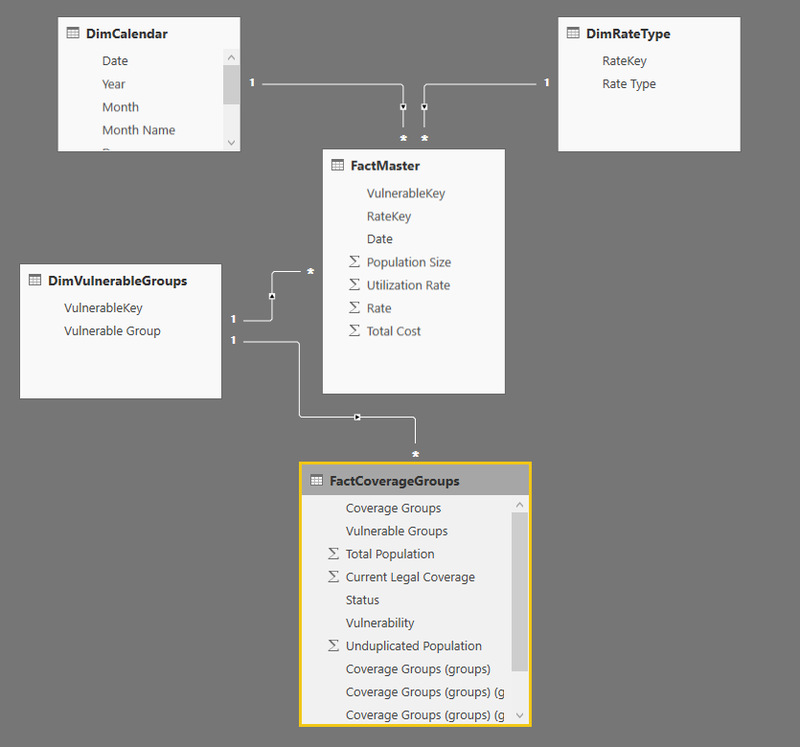 The pattern of getting a cumulative sum is to use Filter ( ALL (Date)… Once that ALL is put in, which removes filters, it gives the cumulative sum of all the years and all the Vulnerable groups selected. So 3q Self-employed will be in all the years not just 2022. And honestly this one is giving me some trouble. Messed around with it a little yesterday but going to look at a little bit more because it’s bothering me I cannot figure this out. There’s a way to do it, just have to think about it some more. But in the meantime, I attached the updated PBIX file. 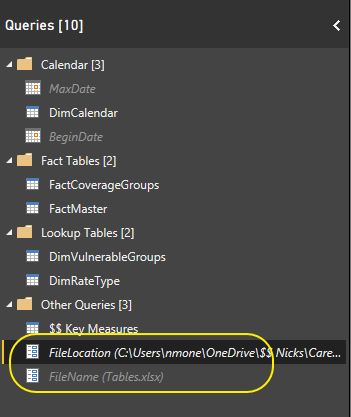 If you go to PQ, you will two parameters, one where you will enter in the File Location of the excel file and then another one where you will enter in the file name. In doing that you will be able to click into the DimCalendar table created. Go through the applied steps of that table and you will see how the calendar was formed. And, then use the MASTER FactTable date variable to calculate the annual cumulative total. As a final step, I reintroduced a MAX on the increase for the cumulative total by group measure. Basically, the costs increase by 20% per year and (mostly) level off after 5 years exempting a small population increase. This also seems to be working well. Now, I need to do the same for the second measure so the annual cumulative total matches the MAX cumulative total by group. So, we are kind of back to the drawing board… However, I have a feeling that you will know the trick. Here is my new and improved .pbix file with some other upgrades. Thanks in advance for any and all ideas you may have.